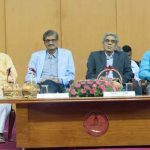 Jalandhar: Multinational technology company- ‘Microsoft’ and Lovely Professional University came together for organizing unique accessibility camp for boosting technology access to people with disabilities. It was to share the best accessibility practices for helping differently-able persons in realizing their full potential. The camp motivated digital inclusion, and ensured that each individual should have equal access to information, communication technologies, facilities and services of the company. This humane organization brought together NGOs including Association of Spinal Cord Injury Affected Persons; technologists; researchers, NSS Volunteers, other awakened and technologically sound students. 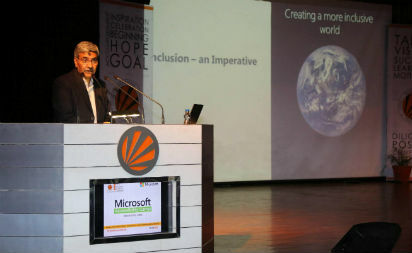 On this occasion, Group Director (Government Affairs and Public Policy Microsoft India) Mr Ashutosh Chadha; Director- Localization and Accessibility, in Microsoft 365 team Mr Balendu Sharma; and, Head Academic Initiatives at Microsoft Innovation Centre Mr Venkatesh Sarvasiddhi were present. The event featured a series of sessions focused on the role of technology in creating sustainable models for skilling youth with disability. There was also a special focus on the need for regulatory policies for innovation on accessible technologies and inclusive hiring practices. The camp featured several technology-based projects that empower people with disabilities, innovations from non-profit organizations, assistive technologies developed by Microsoft. Addressing the gathering, Group Director Ashutosh Chadha shared: “We need to create novel technologies for broader good of humanity. Now-a-days, inclusion is an imperative and so we should create a more inclusive world. In fact, we aim that everyone should acquire economic independence as an individual and then contribute to the society as well.” Interacting with LPU students, he advised all: “Make the most of the world class facilities available at LPU campus. The future of this planet is in your hands. I want to aware you that the present era is an era of competition between an individual to individual under fast changing technologies. So, be ever prepared to learn, unlearn and relearn for bright career and existence ahead. Sharing about various aspects of accessible technologies, Director Balendu Sharma explained all a lad with dyslexia read for the first time with the help of Microsoft learning tools; another with low vision uses built-in accessibility in Office 365 and Windows 10 to create a perfect presentation on Microsoft’s digital storytelling app ‘Sway’; still another with cerebral palsy uses Office Online and communication device; and, a blind person seeing with Office 365 and Artificial Intelligence facilitating interaction and collaboration.